RALEIGH (WTVD) -- Heads up to all the stargazers! The annual Leonid meteor shower will peak this Friday and Saturday. This meteor shower happens around this time every year as earth crosses the debris of the comet Tempel-Tuttle. We see the meteors or "shooting stars" when that debris vaporizes as it enters the earth's atmosphere. The best time to see the meteor shower will be from midnight to dawn on Friday, November 17 and Saturday, November 18. You can expect to see about 10 to 15 meteors per hour especially right before dawn. This year skies will be very dark because of a new moon this weekend, making it easier to see those meteors. The shower is called the Leonids because the meteors radiate from the mane of the constellation Leo the Lion. So when you head out look east in order to get the best view. 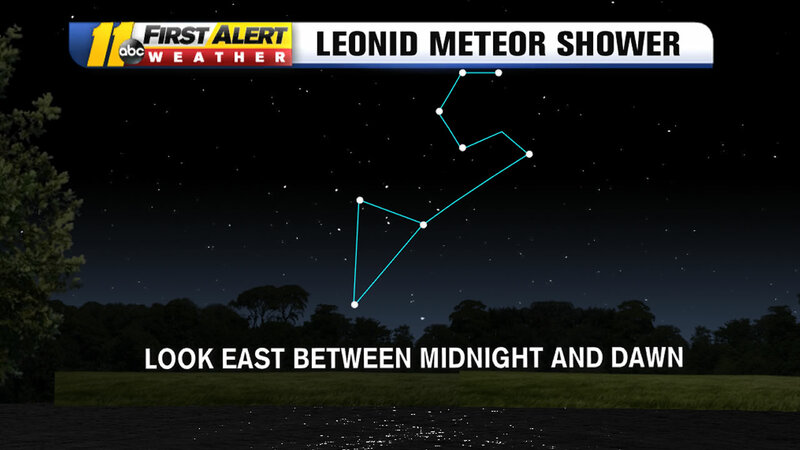 Friday morning will be the best day to see the Leonids here in North Carolina due to clear skies. There is a chance for a few more clouds early Saturday ahead of our next rain chance.